When José Mourinho’s assistant Rui Faria left Manchester United in May, people didn’t expect him to take long to find a job as a manager. With big experience at clubs such as Porto, Inter Milan, Real Madrid, Chelsea and Manchester United, his past certainly makes him a qualified candidate to take charge of a club. Now Faria has been pointed out as an option for Sporting in the last week, and Record claims that he’s actually turned down the opportunity. 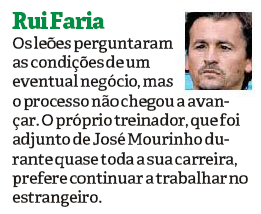 The newspaper reports that Sporting did make a contact to know Faria’s conditions, but things didn’t advance, as his priority would be to work outside of Portugal. When Faria left Manchester United, José Mourinho did say his assistant was looking to spend some time with his family in Portugal. But now five months later, we’ll probably see his name starting to get involved in the rumour mill once a Premier League or Championship side begin looking for a manager. Especially with the success of Portuguese bosses in English football lately.